I’ve sat through many talks and panels, and I’ve been wondering about how to avoid the basic mistakes. Pirate talks are the solution! 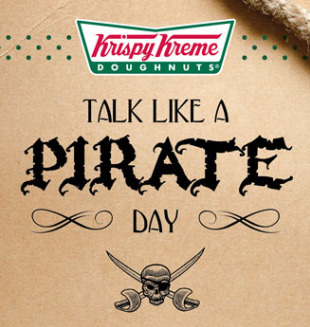 So, why do pirates say “Arrr”? Pirate Talks, with their mnemonic Arrr, which I’ll explain below, are a way to remember how to give great talks or how to participate in panels and other forms of presentations. Pirate Talks also suggest ways to help chair sessions and panels — in any role, you can encourage others to use the Pirate Talk method. Arrr stands for Audience, Remember, Route, and Reflect. Delivery: who is your audience, what do you want them to remember, and what route will you use? Improvement: what reaction did you get, what did you reflect, and what will you revise? Do you know your audience? What assumptions do they have, what do they already know and understand (or think they understand)? How will you find out? If it is a mixed audience, what sorts of people are represented in your audience? What do you want to say? That may not help your audience! What does your audience want to hear? That may not help your audience. You have to align (another A for Arrr!) what they want with what you want to get them to remember. Panels are often a series of short, closely related talks. Often the speakers are so keen to say things, the time slot overruns. The Pirate Panel would start by the chair asking everyone in the audience if they have any questions. Get a few questions going. Soon people in the audience start disagreeing with each other. Now is the time to start the panel, as there is energy and engagement — and the panel presenters now know the audience. At conferences, pirates often sit in on earlier talks to reconnoitre the audience (and the AV system). They also scrutinise other speakers to see what things work best with the audience — and what don’t. Sometimes called “take homes” or (more formally) “learning outcomes” — what do you want the audience to remember? Maybe you want them to remember you are cool, you need contacts, you’ve got solutions to their problems, or maybe you want them to learn a specific solution or skill during the talk or session you are running. The short point is that if you don’t know what your audience is supposed to remember, they won’t remember it. They will remember something like one of your diverting stories instead, or a joke. 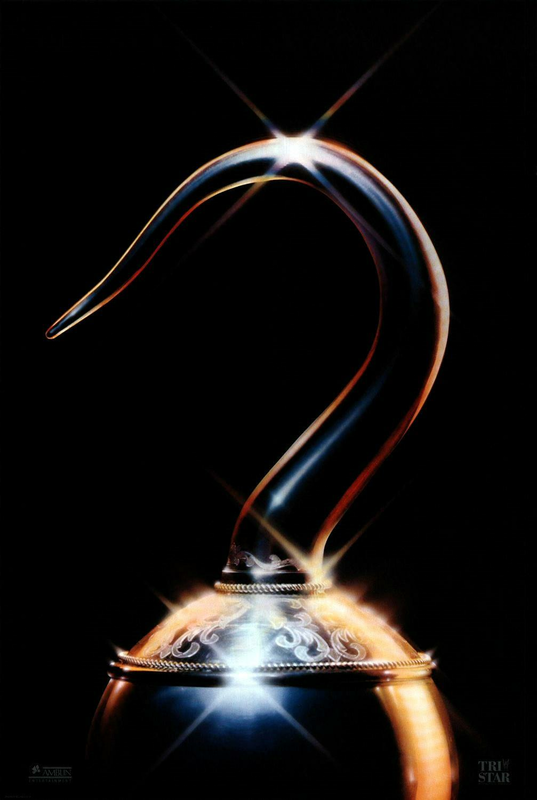 What is your hook that will help your audience remember? It can be fun to keep referring to your hook in creative ways to rub it in. Brief, personal stories make for good hooks. Remember, the best pirates have hooks — and the best piratical hooks have one point that draws the audience in. Move the hook to the front. In a nutshell, if you haven’t worked out the take home, your audience certainly won’t! Now you know your audience and what you want them to remember, plan the route from A to B. You will probably use a program like PowerPoint or Keynote, or something like Word if you are just working on a script to read: these tools readily allow you to develop and rearrange your talk. Do this continually, thinking about the route from A to B and what is relevant to it and what is a diversion, which probably you should delete. If you want any interaction in your presentation, start off interactive. 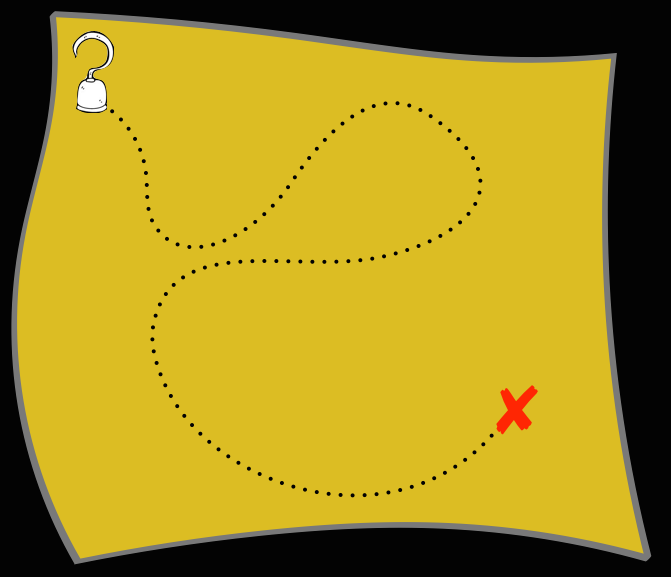 A very simple route that often works well is to start with a scenario, a story or problem (perhaps out of your own life so you and the audience naturally identifies with it) that is unresolved or creates tension; then at the end of the pirate talk, to return to the same story and resolve it using what you want your audience to remember. and then improve what you do. Do you know how successful you were in getting the audience down your route to what you wanted them to remember? Often talks and panels include questions from the audience. Why don’t you also ask the audience some questions? What’s the most useful thing I said for you? How could I improve the pictures/text to be more readable? Don’t leave before you get some feedback, at least don’t always leave without feedback — without reflective feedback, you will not be able to improve. Did the audience really go from A to B? How can you give a better talk next time? Audiences are very bad at giving useful feedback unless you give them specific questions to help you. Poor speakers often disappear immediately after their talks, so they never find out. They never hear the questions and new ideas from the audience that pirates bask in. If you do not reflect about your Pirate Talk, you can’t get better. Where did it go well, where could it be improved? How do other people talk, and what can you learn from them? Finally, right after your talk, revise it so that next time you look at it or need it for the next presentation it is better! You can remember all the slides that confused you; fix them. You can remember the spelling mistakes; fix them. You can remember the better slide order you could have used — well, fix it! (Somebody might ask you for a PDF, so fix the errors before you give it away.) If you don’t revise your talk or presentation, what use was it to reflect? Many people do a lot of preparation for their presentations (even over several years on their research project) and they fall into the trap of thinking their presentation is the end of their work: finally they get to talk about what they have been doing! No! The presentation is when you finally understand what you have been doing, what people are interested in, and how you can go on to develop even better ideas. Your presentation and the thought you put into organising it and filtering it down to the powerful hooks is the foundation for building bigger things. Why should it be the end, when you are asking the audience to start from where you got to? If you have convinced your audience of something worthwhile to think or do, why not be convinced yourself? Many talks fail — or aren’t as good as they could have been — because the landlubber spent their time “talking to PowerPoint” (spending a lot of time writing stuff that PowerPoint sucked out of them) and they lost sight of the fact that they should have been talking to the audience, and using PowerPoint as a tool, not as a word processor. The symptom is a lot of text, complex slides, lots of bullets. Sometimes it happens because the presenter is confused about the difference between audience notes (handouts) and a presentation. They are different, and one of PowerPoint’s beguiling features is that it can make handouts far too easily from bad presentations. If you really want your audience to remember key points, give them an abstract, a list of key points, or anything completely different from your slides; even a blank sheet of paper and a pen so they can make their own notes (see how to take notes here). Landlubbers do not use emptiness, pauses or white space. They talk too fast, have cluttered slides, and do not look at people in the audience. 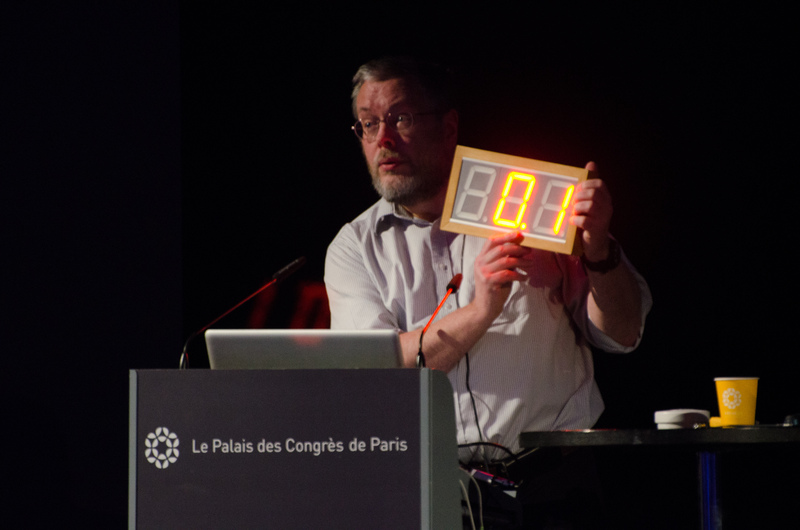 A presentation is theatre, so use pauses for effect and emphasis, not as holes to fill in with your next point. Landlubbers apologise. I’m sorry you can’t read this slide. I had to cut the bottom off the graph. This table is too small to read, but … You aren’t expected to understand this formula but … Clearly, landlubbers do not spend the effort beforehand thinking about the audience to avoid doing things they have to apologise for, nor did they practise and debug the talk before presenting it! Landlubbers try to tell their audience everything (and often ramble while doing so), another symptom of having not worked out what their presentation is about for the audience in front of them. Landlubbers say too much. It is always better to give a short talk with the audience wishing for more, than a long talk and the audience wishing for less. Pirates, in contrast, think of their presentations as the start of a relationship with some people in the audience. They give those people a hunger to find out more from them! Landlubbers think of their presentations just as things to get over with, as the end of all their work. In contrast, pirates think of their presentations as ways to reflect on their thinking, to improve their ideas and to make progress, as ways to engage an audience on their project. Why do people talk to an audience if not to get them to take up and carry on with the ideas they remember? And if you want the audience to carry on, why not you too? Thus a pirate sets out to help their audience, and the work of speaking clearly improves the pirate’s own thoughts, and often, in fact, leads them to new insights that would not have happened without the pressure of preparing a wonderful — piratical — talk and getting feedback from the audience. When landlubbers talk, there isn’t a hook; there is nothing specific (or too many things) for the audience to remember. There was nothing to draw them in, or too much of it was confusing — what did the speak want them to take away? The audience was not engaged, the presentation wasn’t aligned with their knowledge and experience, and probably the landlubber had no idea. Nothing hooked the audience because the landlubber didn’t carefully work out what their hook was. 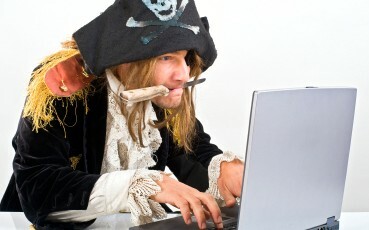 Of course, real pirates have no problems with hooks (and they prefer pistols to bullet points). Please see my web site www.harold.thimbleby.net, especially the bits on teaching. They think, therefore they Arrr. When the pirate’s audience gets the point, they will have an Arrr Arrr moment.